Chinese State Councilor and Foreign Minister Wang Yi reacts during a news conference at the Ministry of Foreign Affairs in Beijing, April 3, 2018. As trade frictions heat up between China and the United States, the two countries are talking tough and giving assurances at the same time that the situation will not spiral out of control. Despite assurances, analysts both in China and in the United States are divided over just how bad the situation could get. President Donald Trump is expected to announce a new tariff list aimed at punishing Beijing over its technology transfer policies and intellectual property theft. And while the two sides have stressed that negotiations and talks are being pursued, there has been little evidence that that is happening. China has said it will take proportional measures to respond to any tariffs enacted by the Trump administration. In response to earlier tariffs on steel and aluminum, China launched levies of up to 25 percent this week on 128 products, including fruits, nuts, pork, wine, steel and aluminum. A man pushes a shopping cart past a display of nuts imported from the United States and other countries at a supermarket in Beijing, April 2, 2018. China’s actions so far have shown self-restraint, but there is there is much more Beijing could do, said economist Hu Xingdou. “For example, China owns lots of U.S. treasury and corporate bonds, buys airplanes from Boeing and soybeans etc.,” Hu said. The initial tariffs that China issued were smart and political, he adds. Most of the items on the list are agricultural products, which China can replace with imports from other markets, Hu said. “I think the move sends a political message even though it is seen as a trade measure. In fact, political calculation is taken into consideration,” he said. Some of the heaviest tariffs were placed on pork and pork products and one key state that is expected to feel the pinch from the new measures is Iowa, a state where support for Trump was strong in the 2016 elections. It is also the home of former governor and now U.S. Ambassador to China Terry Branstad. 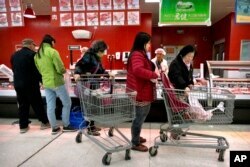 Customers shop for pork at a supermarket in Beijing, March 23, 2018. Swenson, the economist from Iowa State University, said that it is not only pork, but ethanol tariffs on China’s list that will have an impact. “Because Iowa is the nation’s largest producer of corn, ethanol can be produced much more efficiently in Iowa than in any other state,” he said. Some analysts in China believe that if President Trump does push ahead with tariffs targeting intellectual property theft and the country’s technology transfer policies, a trade war is inevitable. Others argue it is unlikely that President Trump will go too far. In an interview with the online news outlet “The Paper,” Yu Chunhai, an economist at Renmin University of China, said while trade frictions will grow, a trade war is unlikely. Yu said Trump is likely to use executive privilege to keep tensions under control and pull back when the costs are too high. But while the building standoff brings both risks and uncertainty, it is also an opportunity. “The crisis also presents an opportunity for China to deepen its reforms, fulfill its WTO commitments and curtail the role of state-owned enterprises in the local economy while opening up the local markets for the banking, insurance and cultural sector,” Hu said. If it is not able to make such changes, however, Hu said the situation is likely to get worse. China has recently pledged to further open up its banking and insurance sector, but the time frame for that to happen is still three years down the road. Joyce Huang and Ira Mellman in Washington DC contributed to this report.